ON MAY 17th 2017 Rod Rosenstein, America’s deputy attorney-general, signed an order appointing Robert Mueller, a former federal prosecutor and FBI director, special counsel, charged with investigating “any links and/or co-ordination between the Russian government and individuals associated with the campaign of Donald Trump”, as well as “any matters that arose or may arise directly from the investigation.” His investigation has so far produced 37 indictments and guilty pleas. Among the latter group are five people who worked for Mr Trump, including his former campaign chair (Paul Manafort), national-security adviser (Michael Flynn) and personal lawyer (Michael Cohen). A final report from Mr Mueller is expected soon. What happens then? Many members of the public seem to be expecting Mr Mueller to produce a report a bit like the one produced by the 9/11 commission, that they can read and then use to form a judgment on the 45th president. They are likely to be disappointed, at least at first. 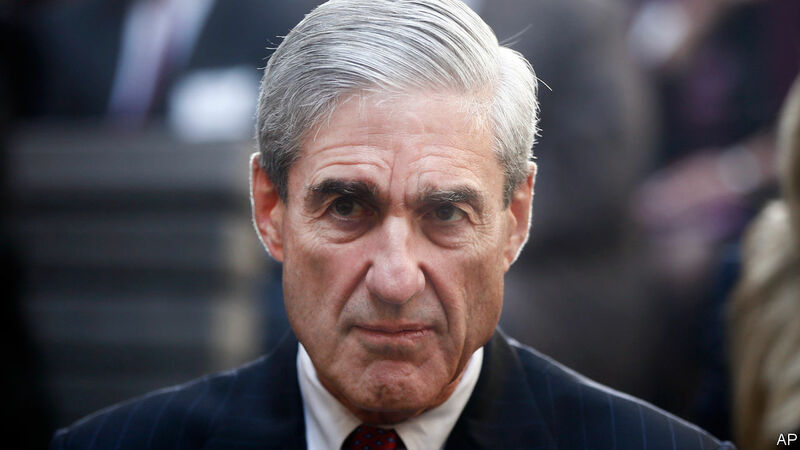 The statutes governing Mr Mueller’s appointment and delineating his power require him to provide William Barr, Mr Trump’s newly confirmed attorney-general, with “a confidential report explaining the prosecution or declination decisions reached by the Special Counsel.” Thus the report could be nothing more than a skeletal document that simply points to other, already public charging documents and explains why he declined to file any others. Or it could be a trove of new facts and analyses. Or it could be anything in between. What happens after delivery depends first on Mr Barr. The special-counsel statutes allow but do not require that he make the report public. He must, though, tell Congress when Mr Mueller’s investigation has ended. The statutes also require Mr Barr to tell Congress about any occasions on which he overruled Mr Mueller’s judgment (“concluded that a proposed action by a Special Counsel was so inappropriate or unwarranted under established Departmental practices that it should not be pursued”). Mr Barr has called Mr Mueller’s investigation into obstruction of justice “fatally misconceived”, but also believes it important that “the public and Congress be informed of the results of the Special Counsel’s work”. Yet when asked directly whether he would make Mr Mueller’s report public, he said only that he would “make as much information available as I can consistent with the rules and regulations.” Precisely what that means is unclear: Justice Department guidelines warn against indicting a sitting president and naming unindicted people in charging documents. That could be spun into a justification for omitting any mention of Mr Trump from the document Mr Barr makes public. His department will also likely redact information from classified sources. Still, the public will clamour for a maximal release. As Richard Nixon said in 1973, “People have got to know whether or not their president is a crook.” Mr Barr said he would issue a “summary” of the report to Congress. That will almost certainly leak (from Democrats if it is damning, from Republicans if it is largely exculpatory). Adam Schiff, a Democrat who chairs the House Intelligence Committee, said on February 24th that Congress will “obviously subpoena the report. We will bring in Bob Mueller to testify before Congress. We will take it to court if necessary.” One way or another, the public will eventually learn what is in Mr Mueller’s report. But it is unlikely to resolve the most pressing questions it raises, which ultimately are neither legal nor criminal, but political, and hence likely to burn for at least the next two years.